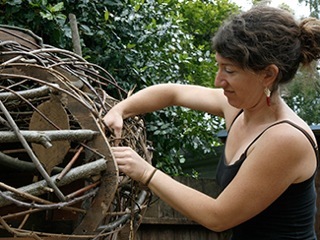 Looking to deepen your learning journey with Permaculture, get more experience on design and implementation, receive feedback from qualified mentors, and build your professional design portfolio? 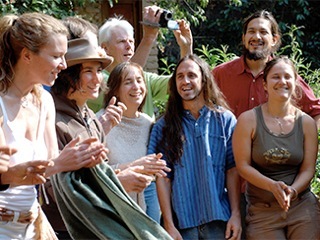 We are excited to announce the International Diploma of Permaculture Design, as well as other new on-line programs launching this September and in January 2013 through Gaia University. Join us on Wed, July 25 for a Free Webinar Conversation with Liora Adler – co-founder and president of Gaia University on Unleashing the Re-Evolution: Gaia University & the International Diploma of Permaculture Design. More information on both the Free Webinar Conversation and the International Diploma of Permaculture Design are below. The International Diploma of Permaculture Design (IDPD) is a Gaia University International program, launched in February of 2012. Its goal is to train and empower the next generation of action-oriented permaculture designers. Through active permaculture mentoring and digital documentation, the IDPD supports real people and real projects to regenerate ecological, economic, and social landscapes while maintaining a high level of quality assurance. 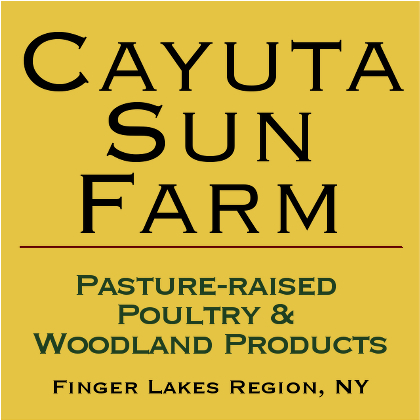 This action-learning educational program is process-oriented, learner-directed, and focused on designing and implementing real-life permaculture projects. Participants in the program (Diploma Candidates) carry out projects in their communities with the support of advisors, mentors and a global network of permaculture practitioners. Diploma candidates document their work online in a shared ePortfolio format so that it can be reviewed by peers & mentors and, as appropriate, released to the public to showcase permaculture to the world. Over a minimum of two years and 10 design projects, Diploma candidates learn the skills of professional permaculture design and earn credits towards their Diploma and, if accepted, towards a one-year BSc or MSc degree with Gaia University in Integrative Ecosocial Design. * If proven solutions to educational paralysis, climate change and other global crises exist, why, on a personal and societal level, are we not implementing them powerfully and effectively? * Are our current institutions capable of adapting to become partners in the great turning, or are they an intractable part of the problem? During this on-line call with Gaia University co-founder and president Liora Adler, we discuss the above questions through a World-Cafe format. After a time for each group to report on their thinking and discuss the results coming out of the various groups, Liora will give a short talk on how Gaia University addresses these dilemmas and will also answer questions and facilitate further interactive discussion. We will end the call talking about the new International Diploma of Applied Permaculture Design. To Register for the Webinar Conversation Click Here. The International Diploma of Permaculture Design grows out of the original action learning Diploma established by the Permaculture Academy of Britain in the 1990’s (originally intended as an open source design), and has been adopted in full or in part by Permaculture Associations and Nodes in Italy, Germany, Israel, Spain, Britain and Chile. While designed to support a unique learning journey tailored to the individual, the International Diploma of Permaculture Design is an open source design that can be used and adapted by any permaculture learning and education node in the world, free of charge! To serve those permaculture learners who are not in regions and zones that currently offer a functional pathway to the Diploma. To serve those permaculture teachers who understand the benefits of continued, supported progression in the Permaculture Design and Teaching community, would like to participate as paid mentors and yet who do not want to service the administration, the portfolio systems and quality assurance oversight necessary for a coherent system. To gather the work of permaculture learners and their mentors into a common e-Portfolio platform (open to the public) where peer and professional review can be facilitated according to clear criteria. To initiate another round of international cooperation between vaious Diploma nodes with a view to establishing a viable Credit Accumulation and Transfer System thus enabling graduates of all nodes to use their Diplomas as a common qualifier. To add additional earning and work-exchange opportunities to the portfolio of experienced permaculture teachers and practitioners as they work at the essential process of mentor permaculture learners. The International Permaculture Diploma Learning learning design follows the generic pattern of all the Diplomas and Pathways in Gaia University by using a Transformative Action Learning methodology. Output packets (focused on permaculture design work for this diploma) are produced by the associate, 10 being required for a full Diploma. Using these common patterns has some key benefits of which the most substantial is that successful Diploma associates arrive at the end of their program fully prepared to apply for a capstone degree program with Gaia University. Depending on age and experience, this may be either a full Bachelors or Masters degree in Integrative Ecosocial Design. For More Information on Gaia Universities Degree Programs in Integrative EcoSocial Design Click Here. Recognizing that life and learning unfolds in a unique way and timeline for everyone, you can pursue the International Permaculture Diploma at a pace determined by you. There is no limit to how long you can take to complete a program. With this style a program year may extend to over 2 or 3 calendar years, or happen more quickly. This approach suits busy world changers, nomads, international travelers, professionals and barefoot permaculture people alike. You can pay your tuition and review in Pay-as-You-Go mode, only engaging when you have the time, motivation and internet access. Even when not ‘on-program’ you can buy mentoring sessions to support you in developing a successful permaculture livelihood and/or practice. Alternatively you can scrum down and barrel through the program in a traditional non-stop style in which case a program year corresponds to a calendar year and the Diploma takes a minimum of 2 years. Discounts apply for this approach. You can also switch from one track to another by arrangement. Diplomas are a lighter, more flexible and lower cost way to gather and practice skill-flexes than full degrees. Meanwhile they provide many similar advantages such as the opportunity to explore and develop your competencies in the world of real projects. Diplomas, due to their relative lightness, can realistically be stacked together to make up a very broad portfolio. So, for example, the permaculture designer with a deep interest in social development can first hone their permaculture design skills through the International Diploma of Permaculture Design (IDPD) and then add a Diploma in Action for Resilience (DL&F) to extend their repertoire. There is no limit to the expansions that can be made through this plug-in approach. Orientation workshops which we call “Learning Online with Gaia U” are the starting point of every Gaia University associates learning journey. The two modules which take place over 4 weeks are stimulating, fun and highly participatory, consisting of webinars, readings and forum discussions. We believe in the development of whole people, discovery learning and skill-flex development. After the orientation course new associates will begin their journey on the Permaculture Diploma design projects, mentorship, and documentation through their ePortfolio. One of the benefits of the Permaculture Diploma is that it provides a structured, guided journey to build and showcase your design portfolio as a Permaculture Professional. Throughout your Learning Journey you will be developing an online ePortfolio to showcase your work. Your ePortfolio is developed on the same platform (Mahara) that is used across Gaia University, and you will have access to all Diploma and Degree associates for social networking and collaborative group working. Mahara includes an easy-to-use export function that means you can, at any time, export your entire portfolio ready for upload to any content management system of your choice. Gaia University is a university without walls, a university across borders, an un-institution intent on fostering a zestful, purposeful, global community of thoughtful learners and unlearners focused on ecological regeneration and social justice. We start from the perspective that it is your life, your passions, your projects, your vision – and the rapidly changing contexts in which they are emerging – that best give rise to what you need to learn and how you need to learn it. 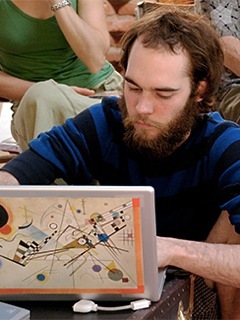 Gaia University offers a unique and flexible model for learning and unlearning based on self-directed, project-based pathways. With a minimum of required courses set by us, you devote the major part of your energy towards the design, implementation and documentation of real-world projects. We provide a multidimensional support web of advisers and mentors who assist you in the practical development of your projects and encourage you to develop your capacity to think critically about your work and inner processes. 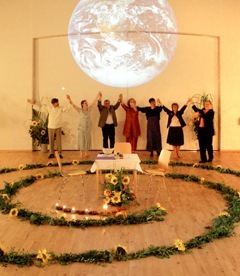 Gaia University was founded to contribute significantly to growing a coherent global worknet of action-learning, open professionals working in full-spectrum guilds as integrative ecosocial designers, facilitators, and managers who are leaderfully engaged in a supported, synergistic web of all-scale, all-quadrant projects designed for human transformation towards ecological regeneration and social justice. A primary goal for Gaia University is to co-create, with myriad partners, a thriving ecosocial economy in which millions can make their livings independent of the current ecosocially destructive dominant culture. Additionally, Gaia University is working to support generators and keepers of both non-conventional and conventional knowledge focused on ecosocial regeneration. * Prerequisite: The International Diploma in Permaculture Design requires the successful completion of a Permaculture Design Certificate Course.